It’s a universal experience to be seated next to a crying baby on a plane and have that primal desire to hush it, but the March of Dimes wants to remind us that the sound of a baby’s cry is something beautiful— it’s the sound of life. In their new campaign created by Kansas City-based agency Barkley, the March of Dimes wants to generate awareness that they are creating a brighter future and healthier tomorrow for all babies through programs, education, scientific research and advocacy, not just those born prematurely. "We wanted to create something that proved how the organization celebrates every baby's first sign of life: the cry. Turning those screams and tears into a beautiful lullaby felt like a fitting tribute,” says Katy Hornaday, EVP Executive Creative Director at Barkley. To create the lullaby, Barkley created a site that invited parents to “donate a cry” by sharing an audio or video file. They then worked with a music partner to incorporate the donated cries along with real babies’ recorded cries into the notes of Brahm’s Lullaby. 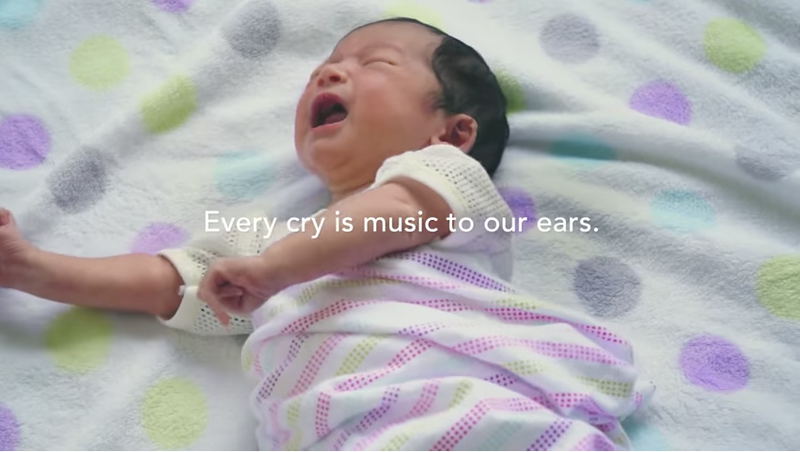 As part of their larger “Give Them Tomorrow” campaign, the 30 second “lullacry” spot was also turned into a two-hour long-form lullaby video on YouTube designed to comfort and sooth the nerves of crying babies and new parents alike. Over the next few weeks, the March of Dimes will also be sending 6,000 new moms gift boxes that symbolize the research, programs and advocacy that moms and babies have benefitted from for the past 80 years.